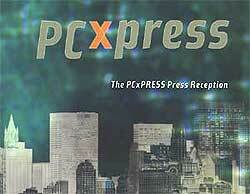 PCxPress event at PC Expo 1999. IBM's new Microdrive introduced this week offers the same portable virtues as its 340MB predecessor but with three times the capacity (a full gigabyte). Just plug the roomy drive into any device with a compatible CompactFlash+ Type II or PCMCIA slot (using an adapter), and you'll gain vast quantities of space for your applications, images, or digital audio files. Amazingly, the new drive is less of a drain on your batteries than the previous models and has a 50% higher shock rating than before. The new 1GB Microdrive will retail for less than $500 while a 512MB model will sell for under $400. Those prices help keep IBM's Microdrives on top as just about the cheapest (per megabyte) and highest capacity option for demanding portable storage. Acer, Casio, Kodak, Fujifilm, Hewlett-Packard, i2Go, Minolta, Nikon, Psion, RICOH, and Sanyo. Lexmark has completed the updating of their color inkjet product line which started in May 2000 with the shipping of the Lexmark Z52. Shown here, the Z32 (left) and Z42 (right) both feature Lexmark’s Accu-Feed paper handling for printing reliability and fewer paper jams, BOTH USB and parallel ports for compatibility, easy open cartridge install and software ink level indicators for ease of use, both PC & Mac driver software for greater adaptability and a next-business day warranty exchange for peace of mind. The difference between these two models are speed and resolution. The Z32 is only 1200x1200 dpi (remember when this was a description of a $2,000 printer?) and can print at 7.5 ppm in black and white and 3.5 ppm in color and retails for only $99. The Z42 is a 2400x1200 dpi printer and has a 10 ppm black and white and 5 ppm color speed. It retails for $149. If that’s not enough, Lexmark has also announced the Z12, a 1200x1200 dpi printer which retails at a mere $59. Now, Lexmark has an updated line of four new printers, that all retail for under $200 gives consumers plenty of choice in both price and feature set. These high quality, inexpensive color printers each have quality output that I expect from Lexmark. Reviews OnLine reviewed the Z52 last month and felt that Lexmark had raised the bar when it came to inexpensive, high quality color printing. Lexmark is out to make color laser printing affordable with the new Optra C710. 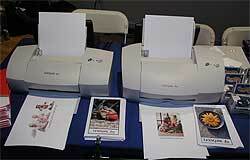 For around $1,899 the compact printer will deliver 1200x1200 dpi resolution in color at a rate of 3 pages per minute. Monochrome printing is rated at 16 pages per minute. In addition, the printer comes standard with 32MB and is expandable to 384MB. Nikon has reason to show off its new Coolpix digital camera this week. Besides its respectable pedigree, the Coolpix 990 boasts multiple megapixel resolution, some semi-pro features, and a killer software bundle. While you shouldn't blindly follow the "more pixels is better" trend, the fact that this camera grabs 3 and 1/3 times as many pixels as many of last year's cameras, should make it worth a look. Also, while many manufacturers think gobs of resolution makes up for a whimpy zoom, Nikon has wisely kept the 3x optical zoom (with additional Coolpix lenses available). In addition, you get a unique, step-less 4x digital zoom that smooths the sudden jumps between digital zoom levels. Nikon has made sure that all that extra resolution isn't wasted by adding the option to save uncompressed images in the camera. Once uploaded to your PC, however, you can use software (Altimira's Genuine Fractals LE) that Nikon has thoughtfully bundled with the camera to compress these multi-megabyte images down to a manageable size with little visible loss of detail. More professional features include the ability to sync up to four external flashes to the camera. Yet, when a picture requires natural light, the Coolpix 990 can be set to soak up the same low-light detail as ISO 400 film. Even with all the lighting and exposure controls, capturing a hand-held snapshot at exactly the right moment usually requires a fair bit of luck. But, the 990 offers a mode that will squeeze off 10 shots in 5 seconds and automatically choose the most detailed, jitter-free image. Details like these suggest that Nikon understands the process of photography and cares about the end result: A quality captured image. If they've applied that philosophy as well to this camera as its predecessors, the Coolpix 990 should deliver the goods. - Dimensions: 5.9" x 3.1" x 1.5"